AngelList connects the world to startup companies through recruitment and investment opportunities. With Greenhouse Recruiting's AngelList integration, matches and applicants made in AngelList will be created in Greenhouse as new candidates and linked to the appropriate job. To learn more about the AngelList's integration, please see How do ATS integrations work? Follow the instructions to generate an API key and paste it into the text box. Click the Connect to Greenhouse button. Once connected, select a sync type from the options listed. Note: Candidate sync (applicants and matches) is a Premium Jobs feature. 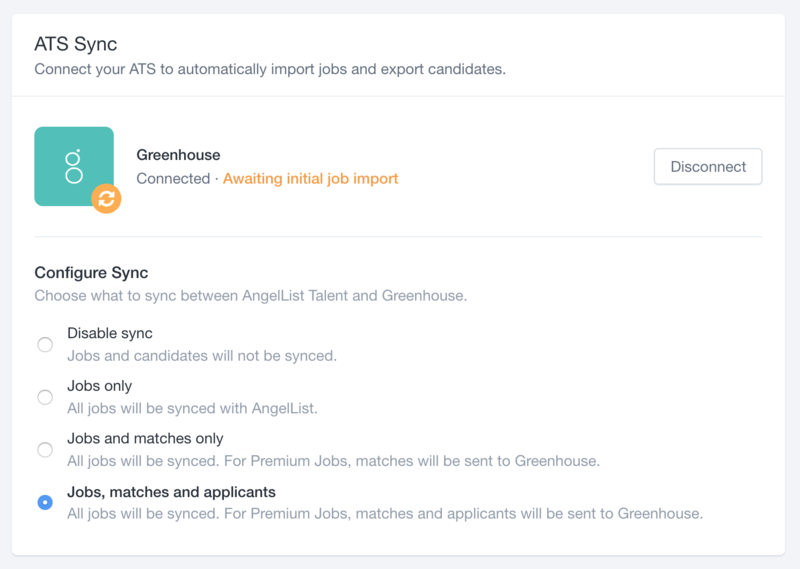 Once you've selected a sync type, AngelList will automatically pull in your public job postings from Greenhouse. The Import Jobs section will list the jobs AngelList pulls in from Greenhouse. For each job, select a mapping option using the dropdown menu in the upper right-hand corner. If this is a new job, choose Import as new job. 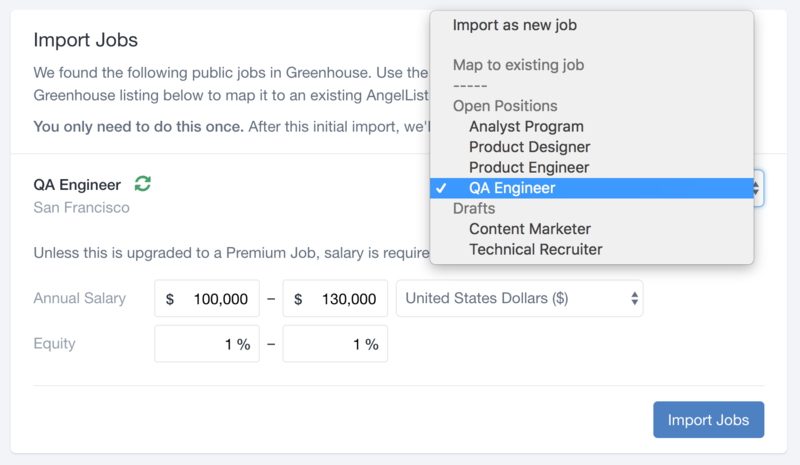 If you already posted this job in AngelList, choose it from the options under Map to existing job. This will prevent us from creating duplicate jobs. We highly encourage you to add salary and equity information here to increase inbound quality, as candidates often add compensation filters to their job searches. Click the Import Jobs button once you are finished. You can view your newly imported jobs at https://angel.co/recruiting/listings. Synced jobs will have a green sync icon next to the job title. If you have the Jobs Only Sync, all of your live job posts in Greenhouse will automatically sync to AngelList. Any candidates that apply on AngelList will be visible in your AngelList account and you will have to go into your AngelList account to manually add those candidates to Greenhouse via “Add a Candidate” or Maildrop. If you selected Jobs and matches only or Jobs, matches and applicants as your sync type, you'll need to upgrade your jobs to Premium in order for candidates to be sent to Greenhouse. In addition, if you left out salary data from any of your imported jobs, these jobs will not be included in search unless they are upgraded to Premium.